The highly dynamic cities that dramatically develop are continuously restructured. In this circumstances, it brings challenges for management sectors. 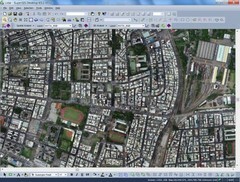 The combination of geographic information systems and newly emerged data format, LiDAR, has become the solution. LiDAR is a data format which is able to record enormous 3D spatial information accurately and quickly; thus, it becomes the predominant source used in domains such as land use and nature resources management, terrain analyses and city 3D model building. Let’s give you a disaster management as an example. Before typhoons arrive, the public sectors need to access locations that are prone to flood and make appropriate and corresponding prevention strategies to trim the cost, decrease the loss of life and soften the impact. 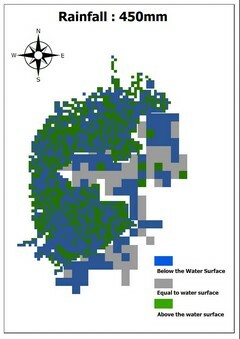 This article integrates SuperGIS products to process LiDAR data and estimate flood regions. In addition, the 3D platform is offered to map and visualize areas impacted by flood and provide authorities with full-view images to make appropriate strategies. The research area is located at southwest of Taiwan, which is on the route of lots of typhoons as shown in fig 1. 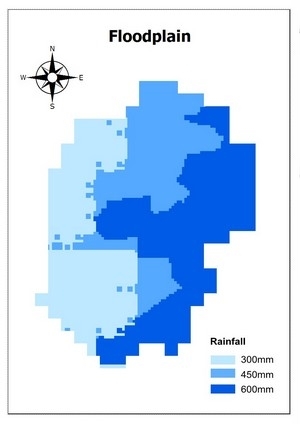 The flood extents are estimated by Water Resource Agency and the water height reaching amount of rainfall of 300mm, 450mm and 600mm is as illustrated in fig2. 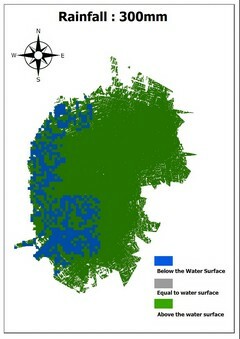 Figure 3: Apply LiDAR data to build city DSM (Digital Surface Model) and evaluate flooded areas. 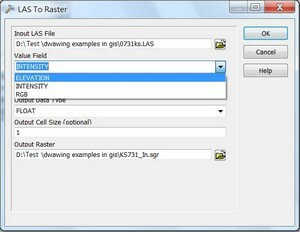 To build high resolution DSM (Digital Surface Model) of research area, we apply the LAS To Raster tool which is able to convert LiDAR data into DSM and RGB image and intensity raster at a given cell size (Fig 4). 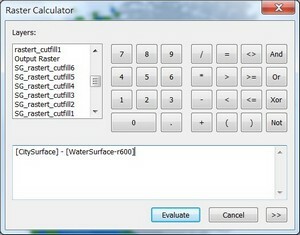 Raster Calculator is applied to compare the height of city DSM and water surface and recognize flooded areas. For better understanding in region of influence, we fuse the city DSM and water surface through SuperGIS Globe to visualize result on 3D platform, and share the images with authorities, private sectors and the public to realize the impact of flood. The results are classified as Above, Below and Equal, and shown as fig 5 below. 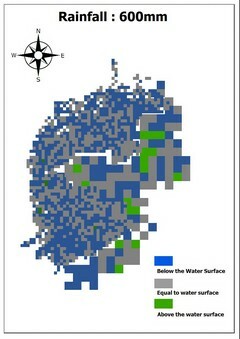 Each area is colored as green, blue and gray respectively according to analysis results so that viewers can tell areas that are potentially flooded. The flood areas expand with the increase of amount of rainfall. The result indicates the left part of research area is prone to flood, and provides information for priorities of disaster rescue arrangement and water management. It is still possible that areas above the flood surface are impacted by flood because of the vertical land use in the city. The 3D visualization can give overall information of flood impact as displayed in fig 6. In this way, the public sectors can enhance rescue efficiency and water management. 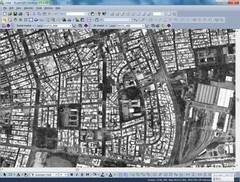 This article gives an example in applying SuperGIS products and LiDAR data in disaster management. With SuperGIS product, users can build high resolution DSM from LiDAR data and identify flood areas through spatial analyses. 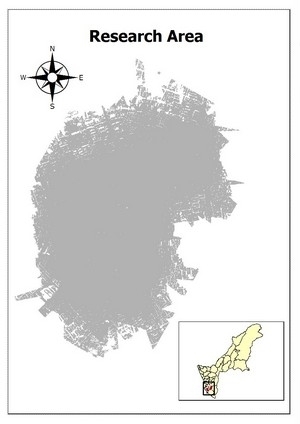 The result indicates that the LiDAR and GIS can help to visualize and manage flood information for dynamic cities, and the predictable losses can be reduced therefore. 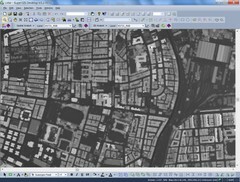 The combination of LiDAR and SuperGIS products can also be applied in land uses and nature resources management, terrain analyses and city 3D model building. Now, let’s utilize the newest technique and SuperGIS products for more possible applications!